A fun summertime catnip toy! 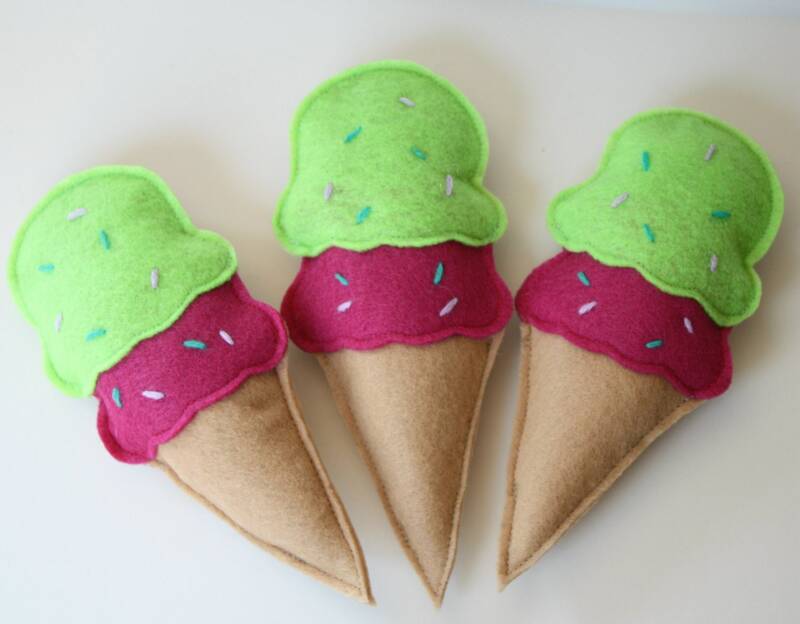 Double scoop felt ice cream cone! With raspberry and pistachio ice cream plus some sprinkles. Sprinkles are hand embroidered on and each cone will be slightly different. The felt is recycled acrylic. These are stuffed with a generous amount of organic catnip/silver vine mix. Everything (except sprinkles) is sturdily machine sewn. They also have a bit of recycled polyfil stuffing to plump them up. These are a good size for kicking! They measure about 7" long by 3" wide. You will get 1 ice cream cone. Got this for my brothers cat and she loves it! My kitty loves the toys! We are never disappointed with her catnip toys. Our fur babies love them and chase us when the mail arrives (it's strong enough to be sniffed through the package). Catnip Ice Cream Cone Cat Toy. Beautifully Made. Great Price. Thank you.